WASHINGTON — Leveraging a $1.1 million incentive from NASA and the Mississippi Development Agency, Space Exploration Technologies Corp. (SpaceX) plans to begin testing components of a methane-fueled engine called Raptor at the Stennis Space Center in Mississippi early next year. 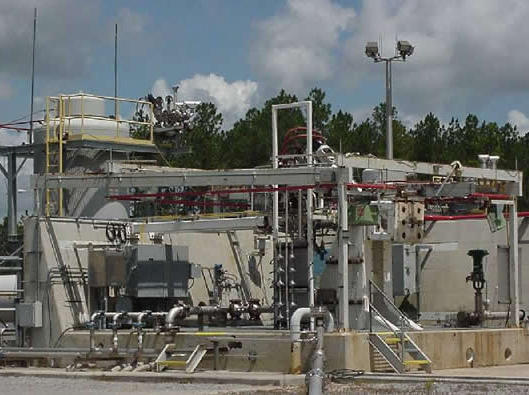 Hawthorne, Calif.-based SpaceX will perform these tests at Stennis’ E-2 test facility, which will require an upgrade to accommodate the full Raptor engine — a closed-loop methane-oxygen concept SpaceX is working on for missions to deep space. The upgrades would be funded by SpaceX, NASA and the Mississippi Development Authority. The E-2 complex was designed for advanced materials testing for the defunct National Aerospace Plane, a horizontal-takeoff-and-landing, single-stage-to-orbit concept that was jointly funded by NASA and the Defense Department before being canceled in 1993. NASA last used the complex in 2012 to test chemical steam generators, agency spokeswoman Rebecca Strecker wrote in an Oct. 25 email. Each of the two stands at E-2 — one is for horizontal engine mounting, one for vertical — is rated for 100,000 pounds of thrust, according to the Stennis website. SpaceX’s Raptor engine is designed to generate more than 661,000 pounds of thrust in a vacuum, Shanklin said. SpaceX founder and Chief Executive Elon Musk has mentioned Raptor before, sometimes in connection with notional plans to colonize Mars. The Raptor name has been applied to multiple SpaceX concept engines, including one that would have been fueled by hydrogen. Staged combustion, also called closed-loop combustion, will be a new trick for SpaceX. The company’s Merlin family of kerosene-fueled rocket engines, currently in use on its Falcon 9 rocket, use an open-cycle, gas-generator configuration. Given identical fuel-oxidizer mixtures and propellant flow volumes, a closed-loop engine is more efficient than one with an open loop configuration. The Mississippi Development Authority, using a tranche of funding from state bond issues, is putting up $500,000 for E-2 modifications, according to Manning McPhillips, chief administrative officer for the authority. NASA will put up as much as $600,000, Strecker told SpaceNews. Testing will not begin until SpaceX and Stennis sign a Space Act Agreement that sets the ground rules, including usage fees, for the company’s activities on government property. Exact terms are still being hashed out, Strecker said. SpaceX’s main rocket-testing facility is near McGregor, Texas. Shanklin would not say whether any Raptor testing had already been done there, or why future tests should be performed at Stennis. One of Stennis’ advantages is its isolation — there are no neighbors to complain about noise, as there are in McGregor. “Stennis has an 125,000 acre (5,060 square kilometer) acoustic buffer zone, which means you can test anything 24-7,” McPhillips said in an Oct. 24 phone interview. “This is the beginning of what we hope is a long-term relationship with SpaceX,” McPhillips said. Stennis has been testing rocket engines since NASA’s earliest days. Most recently, the center hosted testing of the J-2X, a hydrogen-fueled engine conceived to power the upper stage engine of the Space Launch System NASA is building. However, NASA has not identified any mission that requires a J-2X, and the engine is to be mothballed once the current round of testing is complete. SpaceX will not be the only “new space” company to test at Stennis. Blue Origin, the quiet Kent, Wash., firm bankrolled by Amazon.com founder Jeff Bezos, tested the combustion chamber for its 100,000-pound-thrust, hydrogen-fueled BE-3 engine at Stennis in 2012.